If Benjamin said that history had hitherto been written from the standpoint of the victor, and needed to be written from that of the vanquished, we might add that knowledge must indeed present the fatally rectilinear succession of victory and defeat, but should also address itself to those things which were not embraced by this dynamic, which fell by the wayside—what might be called the waste products and blind spots that have escaped the dialectic. I want to understand the philosophy of a growing flower in the middle of a swamp. A woman’s voice on a black video screen asks, “When you imagine the home you wish for, does it imagine you back?” A moving shot of a distant horizon fades from black into view, as she continues, “If you were to walk across the horizon, would you be able to find what you are looking for?” The silhouette of the distant horizon becomes fields of grass and farmland quickly moving against a fixed sky, shot from a passenger’s window on a vehicle speeding by, while the woman wonders out loud where you might find “the space that actually welcomes you, as though you belong there.” And whether such a place even exists. Where is the location where you would feel that the mountain has moved to accept you? Where the land feels like home under your feet? This is the place where you can attempt “to be”. This is the place where your strange brown face can actually live. Fig. 1. Lyra Garcellano, Borders II, 2014, oil on canvas, and Sweep, 2014, moving image. Courtesy of the artist. Fig. 2. 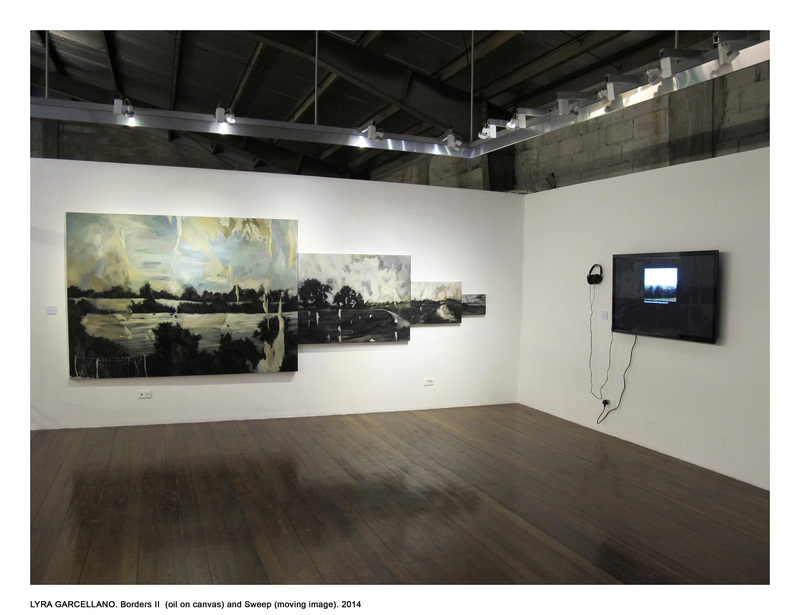 Lyra Garcellano, Sweep, 2014, moving image, and Borders I, 2014, oil on canvas. Courtesy of the artist. 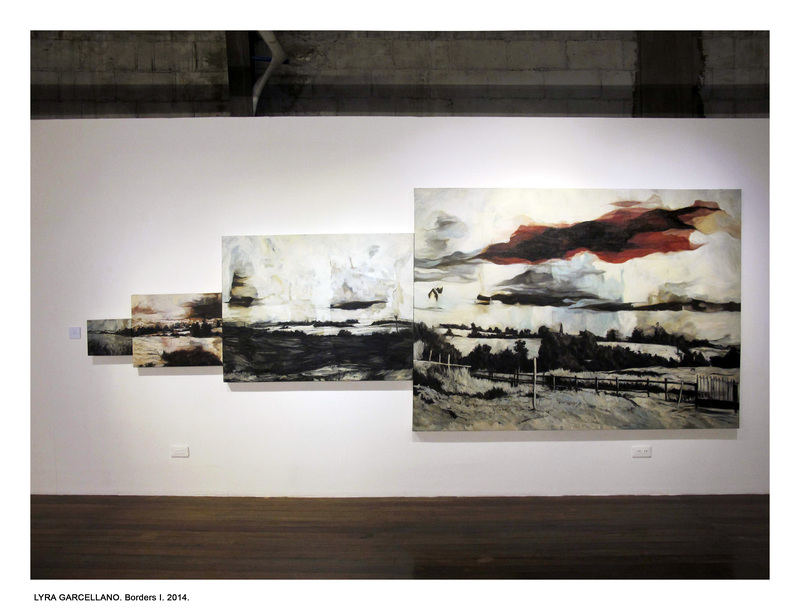 Philippine artist Lyra Garcellano’s 2014 installation, Sweep, mounts this short video meditation on the experience of expulsion from belonging and love, the prohibition of self and life possibility, between two quadriptychs of paintings in expanding, evenly scaled sizes, each doubling the size of the one before. On canvas, the rural scenes in the video—taken on the artist’s travels in France and Bacolod, Philippines—are stilled, rendered in oil in that genre of nineteenth-century European painting, the pure landscape. Here, the pure landscapes are somewhat morbid and forbidding; their shapes droop in macabre fashion, unyielding, ominous, opaque, in drab monochromatic black and white, tinged and smeared with hues of red and blue and yellow. Closely aligned in progressively augmented sizes, with their horizons touching, the paintings physically construct the borders they affectively enact. Opaque and translucent, rag-like forms are scattered over the landscape as if on the surface of the lens or screen of one’s sight. Like the fleeting reflection of the hand-held camera caught every now and then in the video, the color rags evoke the subjective place of viewing even as these same shreds also appear simply to be a part of the land and sky, lifted from them, daubing the clouds and trees. Fig. 3. 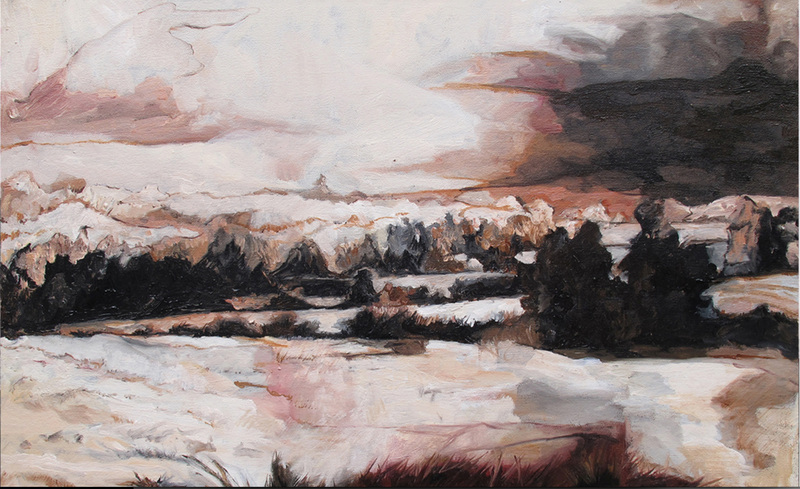 Lyra Garcellano, Borders I, 2014, oil on canvas. Courtesy of the artist. Fig. 4. Detail of Garcellano, Borders I, 2014, oil on canvas. Courtesy of the artist. To mindfully (one might say “critically”) describe what one perceives is to bring into objective being and form the interpretation that makes for the sense of one’s perception. Description is the performance of one’s interpretation, which can be understood as a form of analysis. For Adorno, the interpretation of music through performance was necessarily an analytical act, even in the elementary process of reading notation. As a practice of intimate knowledge and close study, analysis is not, however, only the prerequisite of performance. Adorno suggests that the analytical process must precede and might even converge with the compositional process. Like Garcellano’s speaking in the declarative voice of the borders, the rags of diaphanous and muddy paint draped over the landscape or hovering in the sky among clouds and other natural forms that they ambiguously evoke, blend in with, and set themselves apart from—these tattered and nebulous forms bring into expressive being the artist’s intimate experience of borders. They inscribe onto the landscape the latter’s effect on and meaning for the subject who can see and feel her own repulsed absence in the world that would deny her belonging. Video and paintings thus compose something like a critical performance of a reality it seeks to displace. In a similar vein, our own analysis might read Garcellano’s art work as a form of striving as well as a form of strife. By this I mean that it is a communicative practice that aims to be meaningful and relevant even as it might also want to dislodge or depart from the terms of perception that would make for its very meaning and relevance. Adorno suggests that this apparent paradox is a characteristic tendency of modern music, as of all works of art. For Adorno all modern art, and, even more broadly and pointedly, modern “culture,” depends on the conditions of capitalist production that it seeks to distinguish itself from, if not explicitly oppose. The paradox of assimilation and rebellion is intrinsic to “culture” in a reified world dominated by commodification. It is the enactment of the program of capital’s confrontation of its own limits, and the political response to such limits—the expression of constitutive contradiction and social antagonism. In the age of cognitive or communicative capitalism, however, “culture” has spilled beyond its autonomous sphere as either purified vocation or specialized industry, expanding throughout the social realm and permeating all social, economic, and political life. More than a dimension of all these spheres, “culture” names the creative, cognitive, symbolic, affective activity that in many ways defines the leading paradigm of capitalist accumulation today. In a sense, it constitutes the “forces of production” of contemporary global capital, in its most “advanced” (or value-productive) stage. Where communication and cultural production are value-productive activities comprising some of the fastest-growing capitalist industries with arguably the highest profit margins today, striving in the context of contemporary global art must be understood as the living labor of the artist as a cultural producer. In this global view, Sweep can be interpreted as staging the peculiar form of alienation characteristic of finance dominated global capital: the experience of being bypassed, always close to the circuits of value but kept at once on the move and at a standstill, as the world passes one by. Here the experience of bypass is to be thought of less as loss of one’s own self, than as its interdiction. Not so much loss of life, as its being kept at bay. Bypass is the experience of not getting somewhere—anywhere—even as one is running (operating, trading, fleeing) all the time, as if one were running in place, for life. Such an experience is the effect and condition of the fractal expansion of modes of value-extraction that issue out of the servicing of circulation itself, and not just from the processes of manufacture (where circulation was merely a necessary means and cost for realizing value). As circulation becomes value-productive in its own right, and hence the paramount activity of valued social life, servicing that value-productive activity increasingly becomes the core work of global cities, defining and upholding these metropolitan spaces as emergent autonomous economies and polities, if not formally independent states. To be bypassed is to be placed always just beyond the boundaries of these channels of valorizing movement, to be forced to tread water to simply stay afloat. While the expanding landscape paintings of Sweep are large, objective, and public, the video screen is small like a personal device, and one puts on headphones to overhear this interior monologue of one of the itinerant “could-have-beens” and “should-have-beens” who litter the same path she finds herself in as she imagines walking across a landscape that, she says, is unfinished like history. That voice reveals that, in this evolving landscape, it isn’t what that is bypassed but whom. That it is the one kept on the move but stilled, like refugees placed in a permanent state of never arriving, who sees boundaries and walls suddenly appear. That for the likes of her, maybe of you, the “could-bes” and “would-bes” are foreclosed social possibilities nevertheless held out as compulsory ideals. It is this small personal video that provides the key for subjectifying the walls, or, borders, of a seemingly vast and spacious yet prohibitive and forbidding land and sky. 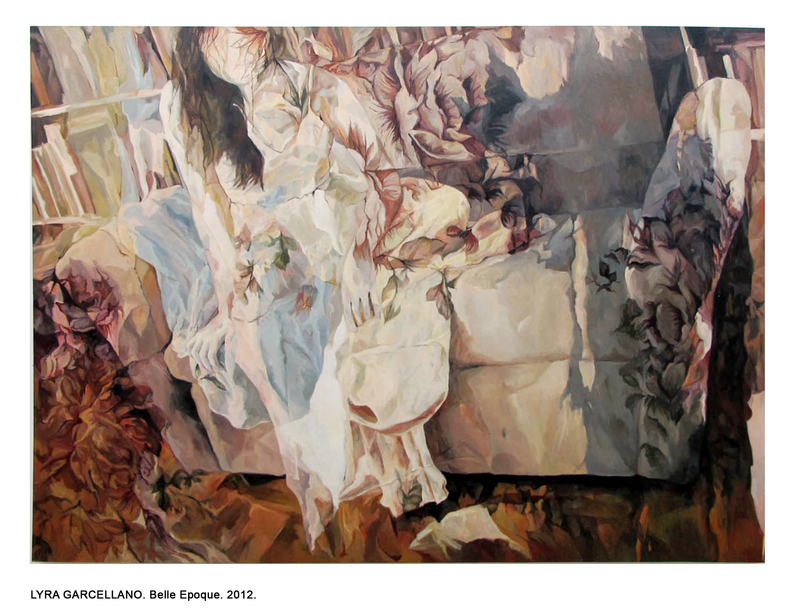 The stark contrast between the seeming mobility and dynamic visuality of the video image, on the one hand, and the seeming stillness and fixity of the painting, on the other, stages the contradiction of a fully globalized economy underlying Garcellano’s own conditions as an artist (the subject of her other works, which probe the driving aspirations, protocols, and barriers within global art circuits and institutions). This is the contradiction between on the one hand, forces beckoning an unprecedented level of inclusion of the once marginalized periphery and, on the other, forces impelling an equally unprecedented level of abandonment and expulsion of entire swathes of the same. It is the contradiction between the divergent fates of the existentially soluble and the existentially solid—fates attending those who embody the social conditions of, respectively, liquidity and mobility, which I discuss elsewhere as comprising the dynamics of contemporary modes of accumulation. These are the tendencies undergirding the global fantasy-project of uber-urbanization, which I call city everywhere. This fantasy-project aims to realize a metropolitanist futurity here and now, a future harnessed to the present of a mobile, urban humanity, rather than in the displaced space-time promised by an older, modern temporality of universal progress. It envisions the city as a total mediacosm where all the channels of urban life from roads to digital telecommunications, from water and electricity lines to e-money and social media, provide complete and instantaneous “access” to “all-inclusive services” necessary for valued social life, anytime, all the time. The city is to be remade as a total mediatic platform soon to be owned and regulated by a few conglomerates capitalizing on the social productivity and connectivity of entire populations of content providers. This fully globalized metropolitanism (no longer exclusively reserved for the imperial nations) does not only count on the capitalizable value of the life-as-labor of the entrepreneurial and investor subjects comprising the ascendant global metropolitan class to fill the channels of this uber-urban mediacosm. 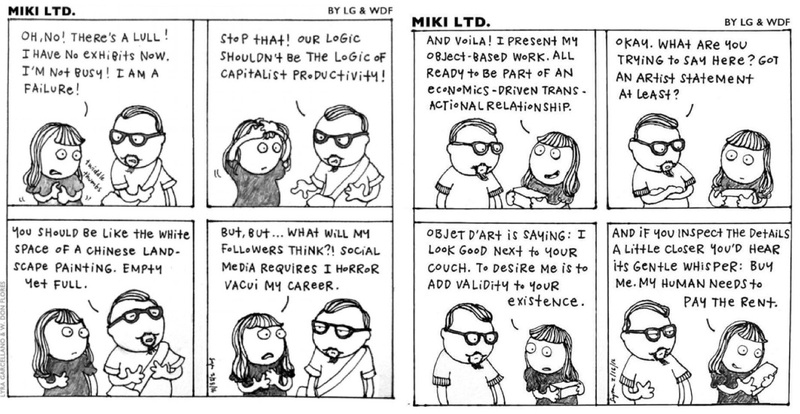 It also depends on the disposable life-times of a service/servant stratum whose primary work is to save and/or produce the valuable time of their clients/employers—that is, to serve as part of the facilitative channeling of (indeed, as vital infrastructure for) the latter’s value-productive movements. This global project of financialized, mediatic urbanization pursued on behalf of a globopolitical humanity thus depends on the consumption and expenditure of the disposable life-times of the those relegated to the proliferating, involuting shorelines of city everywhere, urban peripheries of indefinite detention for lives going nowhere. That is to say, disposable life-times serve as the direct means of enhanced accommodation of the valued lives of a “lyfted” metropolitan humanity. City everywhere is hence not a fixed, geographical place but rather a mobile, distributed, and scaling form of protected and privileged dwelling and fluency of movement, which rests on the expenditure of the resources of survival of those who remain in its temporal outskirts. Those resources consist of untold forms of patience and the ability to bide and make time. Whether the work of waiting on others—servicing, making time for others—or the work of simply waiting—killing time, doing time, lives of waiting without end float the archipelagic ground of global metropolitanism. Sweep provides a crystallization of these global tendencies but from the side of the untenable being and belonging of “the unfixed” and “the dispossessed.” It is this aspect of the work that constitutes its strife. From the side of strife, the paintings are the socioscapes of city everywhere as “land, sky, and mountain” that can “spit you out, leaving you dead cold,” the forces of exclusion and expulsion that is the condition and consequence of this new round of accumulation, as the crisis of refugees and the displaced, deported, and detained everywhere would attest. They are also landscapes of forced disappearances, the rise of extrajudicial punishment as the other arm of the securitizing state, the merged public-private Company that serves as the nation-state franchise of global capital. 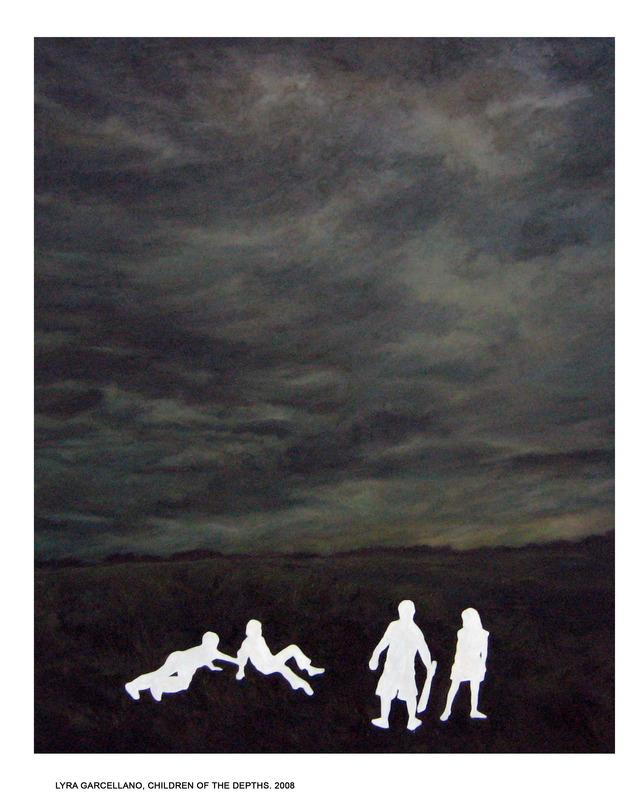 We see these other figures of displacement in Garcellano’s earlier 2008 painting series, Short Stories, where white silhouettes of poor children, playing, fleeing, huddling, are starkly placed against the muddy, broody and heavy colored landscapes of sinister emptiness. White silhouettes are the painting equivalent of forced disappearances, political killings rendered as a form of derealizing and expunging active life, with the outlines of children serving as traces of the rubbing out of the simple right “to be,” to live out life. They directly allude to the flagrant use of extrajudicial capital punishment by the Philippine state (then under Gloria Macapagal Arroyo) against community activists and the disenfranchised communities they work for and with, struggling for an alternative collective future. In guaranteeing the pre-emptive securitization of the metropolitanist nation-state as a global platform for capitalist ventures, extrajudicial capital punishment has become a fundamental part of an emergent mode of governmentality as well as a rampant financial enterprise. Fig. 5. Lyra Garcellano, Children of the Depths, 2008, oil on canvas. Courtesy of the artist. In the transnational space of Sweep, the detail of a homeless “brown face,” mentioned once in passing, speaks to the racism that subtends this new governmentality and its role in the reordering of global capitalism as a political economy of life-times. It speaks to what is fundamental to the experience of bypass, beyond a notion of unmarked capitalist alienation: that is, a global racism that is old and new, an old racism that harkens back to W. E. B. Du Bois’s problem of the color line, recalls Aimé Césaire’s indictment of colonial humanism, and echoes Arendt’s depiction of the fate of surplus peoples—stateless people expelled from humanity—in the march up to WWII, formulations that underscore the direct state forces of war propelling the expulsion of refugees and immigrants today. At the same time, this fleeting reference to an identified face is attributed as the utterance of the land, the mountain, the sky, underscoring the seemingly natural forces of racism’s agency in the making of permanent unsettlement. This new racism, in tandem with an older racism, is the racism of automated calculus for producing disposable life-times—financial-cultural algorithmic programs operating in the uber-urban world, including the global art world, that, by means of the relentless, exponential, super-inflation of the value of its currencies, necessarily facilitate the spending down of the ever-cheapened, ever-discounted life-times of others. This new algorithmic racism operates at every possible scale, no longer only at the scale of the Western European, Anglo-American “human” subject, which served as the measure of value of all life. It is a post-human racism that, all the same, relies on the all too human forced disappearances of clean up campaigns (decades of counter-insurgency and counter-terrorism operations refurbished as urban policing) as part of its operation. It is also the racism of temporary redemption of the absolutely expendable from such punishment, into the second-class citizenship of global servitude. Fig. 6. Lyra Garcellano, Peinture 1, 2013, oil on canvas. Courtesy of the artist. That almost negligible detail of the brown face stands therefore as the sign of a host of attributes that determine non-belonging. It alludes to the devaluation, abjection, and expulsion concomitant with the liberalization of the socio-cultural norms and protocols (the order of cultural values), which regulate, and thereby enclose, the channels of metropolitan belonging. It signals the human refuse that is to be jettisoned and bypassed as a matter of such enclosure, and the “unfinished” histories that have made them so. In this way, and as part of its strife, it points to the extant though revised colonial racism animating contemporary value-production, not least of all the order of cultural value-production that is metropolitan life and global art. If the places explored by Garcellano and Weerasethakul are places of bypass—what, from the point of view of a mobile global humanity at home in the world they would make entirely theirs, can only be seen as dead ends—they are also places of spillover, things spreading beyond their bounds, overflowing or unwinding, wandering and unraveling. In Weerasethakul’s film, Cemetery of Splendor (2016), the dead end is a rural home town, Khon Kaen, a world of sensuous syndromes, of overlapping subjectivities and simultaneous pasts and presents subsisting in spaces of neglect, which are perceivable only in the heightened sensorial state of one with a sleeping sickness, or by those contaminated by such wakeful dreaming in their caring attention to the ill. In this wakeful dreaming—both affliction and respite from the nightmarish somnambulant existence proffered by states and corporate industries—several worlds might inhere or take place in the same abandoned park, and thoughts, sensations, desires, might be transmitted and shared through humans as mediums of each other, in ways that make not debasement but love. We can sense the splendor of Garcellano’s landscapes if we juxtapose them with her painting series, Falling, sensuous but depthless portraits of clothed human figures in ambiguous positions of inertia or languor, where she lingers on the indistinct borders between resting and wasting away, paralysis and escape, sleep and death, repose and defeat. In these works and later revisions, submission is not simply resignation but also an immersion in and blending with one’s surroundings—floors, beds, walls, furniture, all offering themselves up as surfaces with which to place and harmonize a bodily form, with its shape and dress, hair and appendages—exploring the place of forms as an alternate landscape that collapses depth and surface, exteriority and interiority, instantaneity and eternity. Even blanched bodies, which suggest the derealization of life and the draining of vitality, offer hues, shape, and texture to the mulch. Fig. 7. 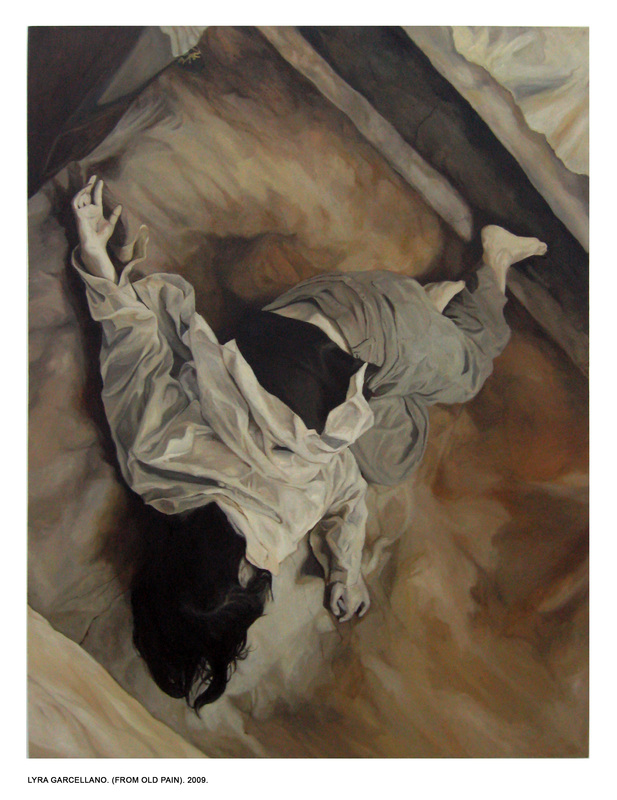 Lyra Garcellano, From Old Pain, 2009, oil on canvas. Courtesy of the artist. Here the ever-increasing acceleration and ceaseless instantaneity that define the temporality of value-producing circulation is stilled with the flatness of filled surface, one that suggests planes of overlapping memory images, like the décor and design of diaphanous bits of wallpaper and upholstery laminated over and alongside one another, layering untold life-times. The eye is drawn to the arrangement and rearrangement—the superfluous play—of things and bodies, the sensuous patterns of accommodations, infinite accommodations over time that leave their remnants like the tattered banners of plural, ambient dreams. Fig. 8. 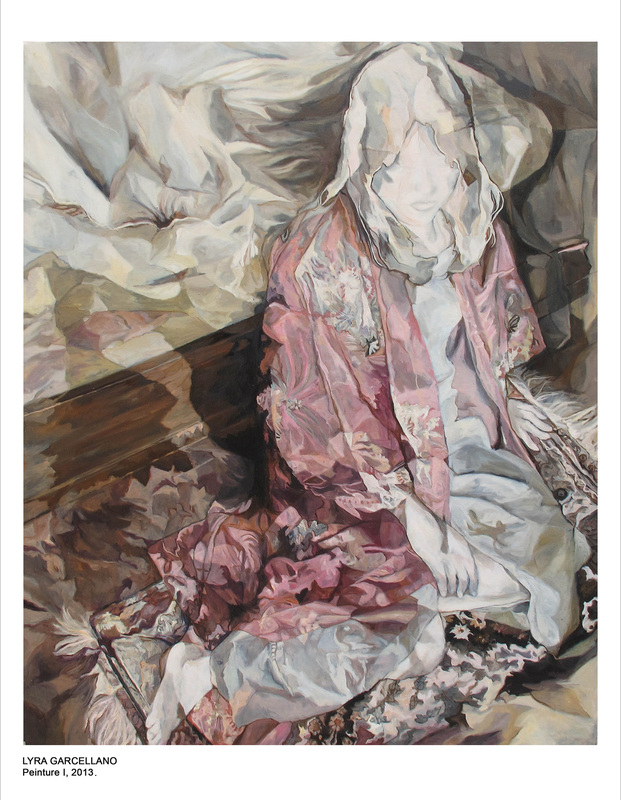 Lyra Garcellano, Belle Epoque, 2012, oil on canvas. Courtesy of the artist. What Garcellano’s work explores, and in this way might be likened to Weerasethakul’s own meditation on the leftover people and spaces of bypassed towns, is the unexpected issue or rather byproduct of tending to one’s own wounds by way of tending to the wounds of others, or better, of simply tending this wound that is one as well as another, this wound that is the you-we of her address. With little regard to promised worlds, or at least with a fullness of leftover life-times, Garcellano’s work explores a life-making activity restored to itself. Hence the sense of non-time or timelessness that feels like fullness rather than emptiness. We might say these works present a genre of time akin but also in contradistinction to Manila male slum dwellers’ experience of buryong, a kind of boredom or insanity, which Steffen Jensen has analyzed as the temporality of masculine redundancy. Buryong, he argues, is the objectification of “the threat of confinement in a present tense being perpetuated into the future.” Jensen reads this personification of the empty time of endless waiting—this embodied figure of an infinite present—as representing “the fear that present-day predicaments will be perpetuated into a future temporal and spatial wasteland” (“Stunted Future,” 54). Such fear I see as the real apprehension of the evacuation of the future life-times of disposable populations for the present capital life of globopolitical humanity. Buryong, the stifling experience of the worthless, useless, meaningless time of disposable life, is the other side of diskarte, a slang word (from the Spanish, descartar, to discard) for “the ability to make something out of the tiniest possibility,” a kind of creative resourcefulness in places of scarce and diminishing resources (53). Diskarte is an art form and a form of getting by and surviving, the profane art of making life out of scraps, fissures, and shifts of space and time, the art of making life as a matter of timing, of biding and making time, which has been key to the social reproduction of the urban excess of the global South. In Garcellano’s work we sense the proximity of both these relations to time—the sprawling of an endless present, and its further unspooling into bits and pieces of flourish; the monumental stillness of stalled life and the lively, small embellishments of improvised life-making. As the highest-value producing Department or sphere of production of capitalism today, “culture” is not simply the arts and the culture industry but the very production of capitalized social life. Hence cultural activity for globopolitical humanity is geared towards an aesthetic of instantaneous, smooth and continuous circulation (the aim and ideal of social media apps where networking and marketing have become indistinct), subscribed, uninterrupted access, and ceaseless and seamless fluency of communication and movement. This is an aesthetic attuned to the temporal as well as sensorial and affective qualities of life-times of value. There are no roads without the places they pass through, without the waysides they create to define the perimeter and parameters of their protocol of movement, what allows them to channel what they aim to convey. Works of literature, art, even urban infrastructure, are always in media res to the degree that they are never objects in themselves, as origins or effects. They are always already in the course of sense-making projects and efforts to institute, follow, implement, alter, corrupt or corrode the codes that organize certain forms of life. To what and how we connect these worldly artifacts (other artifacts, perhaps), or not, will be a matter of “reading,” itself to be viewed as a sense-making effort on par with its objects. That is to say, our own “critical” analysis is also a world-making effort, in its capacity to mediate, to relate (to bring into relation, to heighten the palpability of relations that might be overlooked, actively forgotten or denied because of indifference to or lack of the necessary cultural languages), to generate or contribute to the generation of another material imagination (other modes of perception and feeling, other sensibilities) than that which now governs the value-productive mode of life we are compelled to make a living in. These forms and contents we contribute (in our own role as content providers) are our political bids, what we put out and what we put in as our part in the cultivation of a world that is different from, though also immanent in, the world that now rules us. My own bid entails an attention to the surplus that Sweep, in its communicative labor to render the experience of bypass, creates impromptu: what I suggest is some kind of splendor. That surplus can be viewed among “the waste products and blind spots” that Adorno acknowledged as escaping—indeed, outwitting—the historical dynamic. The seemingly outmoded (but not obsolete) sensuous care with which the landscapes are painted (in the old-fashioned art of oil painting), rendering at once longing, and the emotional marking (the scarring, sullying effect) of that longing’s betrayal—this now artisan-like artistic labor produces something more and other than the meaning that the work might bear for global consumption. It produces the occasion and ground for the revaluing expenditure of otherwise lost or wasted life-times, indeed, for the biding and making of another kind of time. This is a form of idling, not a state or condition, but rather an activity, like an engine running slowly in place, that dilates further, with every brushstroke filling out a pattern, a decorative motif, a figure of sensorial feeling. In this way, the seemingly infinite time of waiting that stretches out indefinitely before one who cannot find a place of belonging (a place, that is, of social meaning, relevance, or purpose) becomes a plethora of immanent life-times of possibility. While the video might encapsulate the “meaning” of this installation in the familiar form of a subject, with a legible political claim, it is in the paintings where that subject is both recalled and undone, in tatters, so to speak. It is in the superfluous (for Adorno, “puerile”; for us, childlike, playful) aimless, imaginative gestures of these paintings across the different series of Garcellano’s work that we glimpse a rendering of the temporal character of what is eclipsed by the installation’s “meaning”: that is, the life-times of persistent “being” that make the world that would not have them (Adorno, Minima Moralia, 151). These are life-times of making time, of filling (not just killing) time, made sensible and rendered back in the constitution of the land, mountain, sky—life-times of waste restored as a feature of the built environment, what now passes for “nature.” In this idling (idyll-ing), wasting and thriving, suffering and dreaming have become one and the same, like the splendor of making life in the midst of life’s remains. Theodor Adorno, Minima Moralia, trans. E. F. N. Jephcott (London: Verso, 2005), 151. Quoted in Film Society of Lincoln Center, filmlinc.org, “Time Regained: The Films of Lav Diaz,” May 2015. filmlinc.org/series/time-regained-the-films-of-lav-diaz/. Lyra Garcellano, Sweep, December 9, 2014–January, 3, 2015. Mixed media installation. 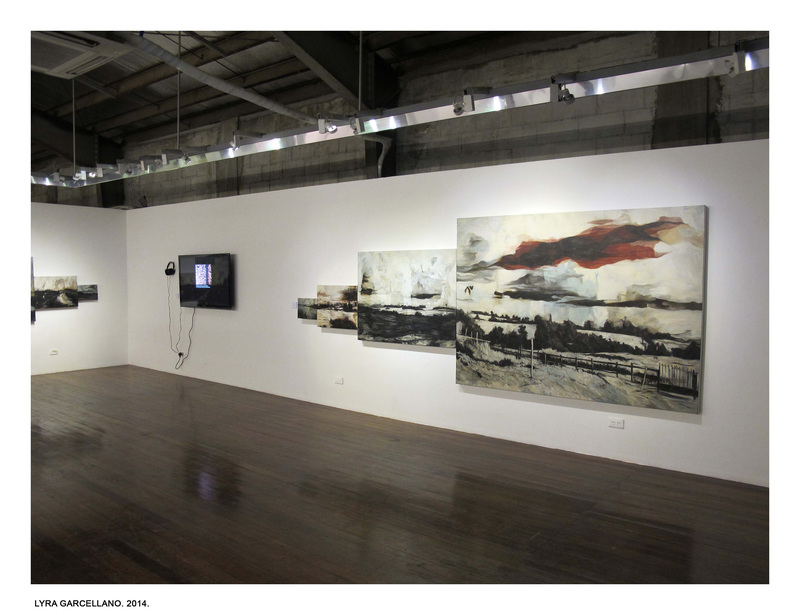 Makati City, Philippines: Finale Art File Gallery. finaleartfile.com/sweep-lyra-garcellano. See T. W. Adorno and Max Paddison, “On the Problem of Musical Analysis,” Music Analysis 1, no. 2 (1982): 169–187, 176. Adorno did not understand description as interpretation, as I am doing here, insofar as he opposed description to the kind of immanent critical analysis he upheld as a valuable political method. However, the kind of description I have in mind is much closer to his own understanding of analysis as a form in its own right, which serves as a medium through which the work unfolds, an organ of the historical momentum of the work itself, but also pushing beyond that individual work. Theodor W. Adorno, “Cultural Criticism and Society,” in Prisms, trans. Samuel Webber and Sheirry Webber (Cambridge, MA: MIT Press, 1997), 17–34. For Franco Berardi, the new form of alienation under post-Fordism is constituted by the loss of self and life through the exploitation of one’s cognitive and mental life as labor—or, “putting the soul to work” (The Soul at Work: From Alienation to Autonomy, trans. Francesca Cadel and Giuseppina Mecchia [Los Angeles: Semiotext(e), 2009], 11). See Eric Tang, Unsettled: Cambodian Refugees in the New York City Hyperghetto (Philadelphia, PA: Temple University Press, 2015), on refugees held captive in a state of never arriving. Including a comic strip where she pokes fun at artists’ ironic, banal subjective experiences of the tacit demands of the global art world within the broader attention economy. See Neferti X. M. Tadiar, “City Everywhere,” Theory, Culture, and Society 33, no. 7–8 (2016): 57–83. See Kontra-Gahum: Academics Against Political Killings, ed. Sarah Raymundo and Roland Tolentino (Manila: IBON Publishing, 2006). In these days of Rodrigo Duterte, it has also become a lucrative derivative economy. See Amnesty International’s report, “If You Are Poor, You Are Killed: Extrajudicial Executions in the Philippines’ ‘War on Drugs’” (January 27, 2017, amnestyusa.org/reports/if-you-are-poor-you-are-killed-extrajudicial-executions-in-the-philippines-war-on-drugs) and Sheila Coronel, “Murder as Enterprise: Police Profiteering in Duterte’s War Against Drugs,” in A Duterte Reader: Critical Essays on Rodrigo Duterte’s Early Presidency, ed. Nicole Curato (Manila, Philippines: Ateneo De Manila University Press, 2017). The emerging metropolitanism here entails not only disposable life rendered serviceable as disposable time, but also the killing of absolutely expendable life, or murder with impunity, as a financial instrument authorized by the state. See Robin D. H. Kelley, “Mike Brown’s Body: Meditations on War, Race and Democracy,” Toni Morrison Lectures, AAS21, Princeton University, 2015. aas.princeton.edu/publication/mike-browns-body-meditations-on-war-race-and-democracy. Steffen Jensen, “Stunted Future: Buryong among Young Men in Manila,” in Ethnographies of Youth and Temporality: Time Objectified, ed. Anne Line Dalsgård, Martin Frederikson, Susanne Højlund, and Lotte Meinert (Philadelphia, PA: Temple University Press, 2014), 41–57, 46. Raymond Williams, “Culture,” in Marxism and Literature (New York: Oxford University Press, 2009), 11–20. This is both like and unlike the notion of “margins,” which was a political concept for the diminished and disempowered in a field of static centers and spheres representing power in the geopolitical image of territorialized polities. Where it departs from this still absolutely important political concept, and what social media and new technologies allow a better view of (insofar as they also make it possible and normal), is the condition of dynamism and virtuality, such that the “road” might be better conceived as the (financial, cultural, technological, and social) means or media of fluency. Hence we would be mistaken if we were to conceive of these waysides, or the effects of bypass, merely in that spatial sense by which we refer to the side of the physical road, the figure of modernism par excellence. Rather we have to understand the bypassed also in the sense of what might slow down or impede this fluency of circulation, and therefore what might corrode the codes of information that allow the circulation of any content whatsoever—that is to say, other codes. One could argue that the unconcern with originality or with newness in these contemporary works is specific to our times of digital technological reproduction. But it is also the case that the history of the colonized is the history of a long habituation to reproduction. For the colonized, copying has always functioned as a way to matter, to be heard, to be seen, to be noted, as well as a way to make fun, to play, to make surplus out of the gap—a form of survival, as well as a form of elaboration of being. The legacy of derivatives as what the colonized are, as well as make, is the legacy of global South artists. Emptying things of their original referents and infusing them with different contents, different connections.